The PhotoBank joins the growing digital photo storage market, and instantly wins points for keeping things simple. 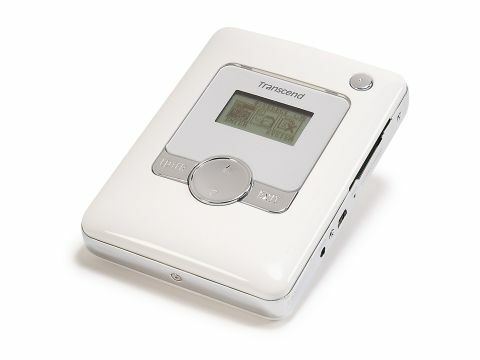 Transcend has taken the functional approach: it has a simple LCD; slots for CompactFlash, SecureDigital, MultiMediaCard, SmartMedia and MemoryStick cards; three large, easy to understand buttons and exceptional navigation. This is matched with solid and stylish design. Functionally, read/write times from a CF to the drive are a little slow but reliable, although without a screen there is no way to check the images. Back home, the device-to-computer transfer times are pleasingly fast. It's nice to see such a simple photo storage device, easy to use, solidly built, and only let down by a relatively low battery life of three hours. It's available in either 20GB or 40GB capacities. If you want more, such as a colour screen, then Transcend also makes the snazzier multimedia Digital Album, which you can use to view your photos as well as listen to your MP3 music collection.